This is not the “Mel Fisher finds the Spanish galleon Atocha” story. That has already been told in numerous books, television documentaries and countless articles. Over the years, I have been asked countless times about my involvement in finding millions of dollars worth of treasure on the bottom of the sea. The value of the treasure certainly gets peoples attention, but what really fascinates them are the personal stories of how it all came about. The unique historical connections are just as compelling. “Sweat of the sun, Tears of the moon” presents three individual story lines that eventually entangle and blend into an inseparable braid. An important thread is Treasure Salvors Inc.’s sometimes brilliant, usually desperate and often self- destructive search for shipwrecked Spanish treasure galleon riches. An initially separate and time-lost narrative of the actual people and events of nearly four hundred years ago progressively reappears, ever more sonorous to the modern story line. These initially ancient sounding accounts evolve into surprisingly strong parallels of Treasure Salvors Inc.’s modern world. Both these story lines support the principal concept of the book. The tale is as much an exploration of life’s many possibilities during the author’s coming of age as it is for sunken treasure. Adventure, personal loss, romance, tragedy, betrayal, greed, and uncommon optimism exceed the realities of finding the richest treasure galleons ever. The story is written in a descriptive style that helps the reader feel they are sharing in the experiences. This perspective on the Treasure Salvors story is unique; it presents the wildly changing fortunes of this unlikely enterprise through the eyes of an actual participant, rather than second or third hand as in other books on the subject. Maps introduced in the story allow the reader to follow the same clues used to unravel the mystery location of 500 million dollars worth of gold, silver and artifacts. 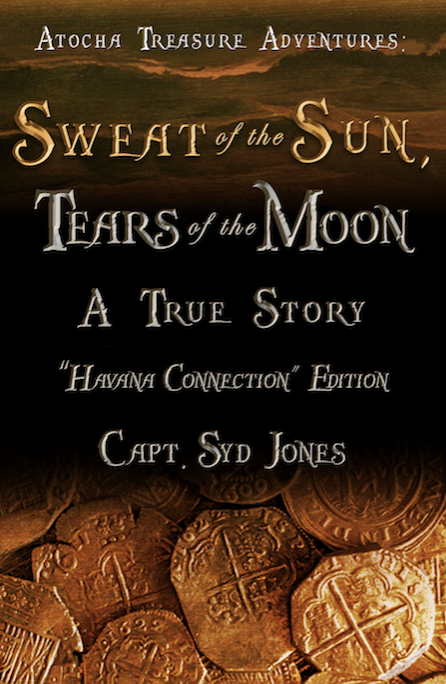 “Sweat of the sun, tears of the moon” is an ancient Inca expression, describing their spiritual perception of gold and silver; the same gold and silver the Spanish coveted, Treasure Salvors searched for and the author found.